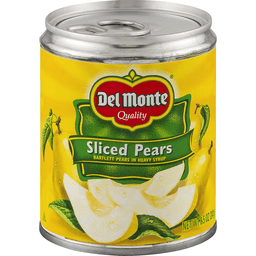 Del Monte® Quality Sliced Pears in Heavy Syrup Bartlett pears. Please recycle. Picked and packed at the peak of ripeness: No preservatives. A delicious, fat-free food for added refreshment, try chilled great for breakfast, snacks, or with lunch. Find great recipes at: www.delmonte.com. Questions or comments Call 1-800-543-3090 (Mon. - Fri.). 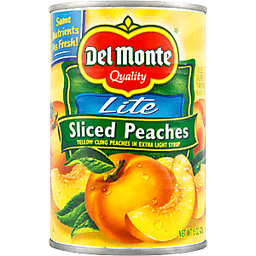 © Del Monte Foods. Bartlett pears in heavy syrup. Garden quality. Serving up our garden's best: Sun-Sweetened Goodness: Our Bartlett pears are grown in the best soils of the Pacific Northwest, producing fruit with a delicate sweetness and just the right firmness. Tasty Nutrition in Every Bite: Picked and packed at the peak of ripeness to capture the fruit's natural fresh flavor and essential nutrients your family craves. Add Some Enjoyment: a tasty topping for yogurt, cereal, salads and more. Facebook: For recipes, contests and conversations, find us on facebook.com/delmonte or visit us at www.delmonte.com. Questions or comments? Call 1-800-543-3090 (Mon.-Fri.). Please provide code information from the end of can when calling or writing. Grown in the USA. Product of USA. Garden quality. Bartlett pears in extra light syrup. 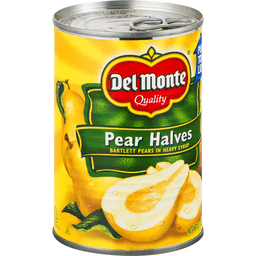 1/3 less calories than pears in heavy syrup. Serving up our garden's best. Sun-Sweetened Goodness: Our Bartlett pears are grown in the best soils of the Pacific Northwest, producing fruit with a delicate sweetness and just the right firmness. Tasty Nutrition in Every Bite: Picked and packed at the peak of ripeness to capture the fruit's natural fresh flavor and essential nutrients your family craves. Add Some Enjoyment: a tasty topping for yogurt, cereal, salads and more. Facebook: For recipes, contests and conversations, find us on facebook.com/delmonte or visit us at www.delmonte.com. Questions or comments? Call 1-800-543-3090 (Mon.-Fri.). Please provide code information from the end of can when calling or writing. Please recycle. 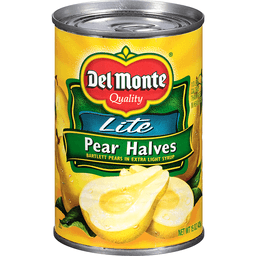 Lite pears 60 calories per serving; pears in heavy syrup 100 calories per serving. Grown in the USA. Product of USA. In heavy syrup. Quality. Picked and packed at the peak of ripeness. No preservatives. Fat-free food. 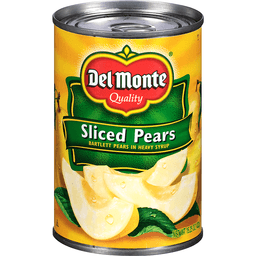 Find Great Recipes at: www.delmonte.com. Questions or comments? Call 1-800-543-3090 (Mon-Fri). Please provide code information from the end of can when calling or writing. Please recycle. Product of USA.